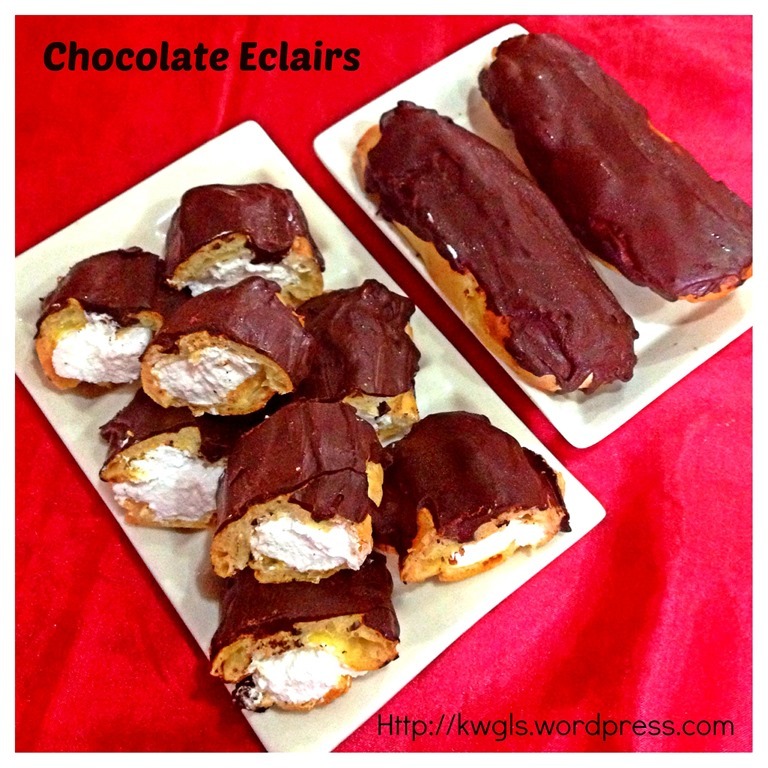 DON’T BE SHOCKED BY MY UGLY CHOCOLATE ECLAIRS!!! 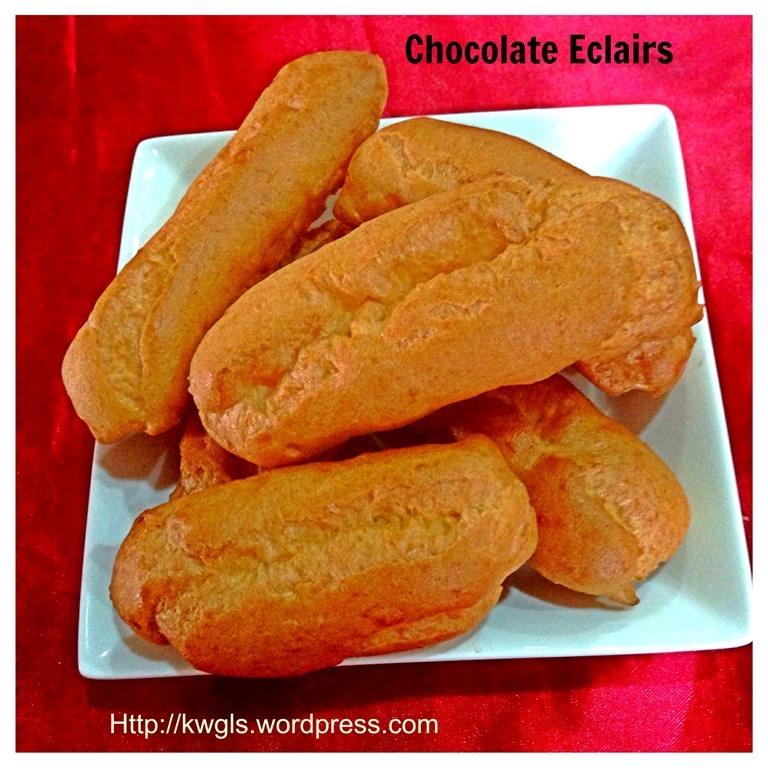 My chocolate éclairs looked like the Chinese dough fritters (you tiao) and I do not know exactly the reasons! I tends to believe that it was due to my uneven pumping techniques. 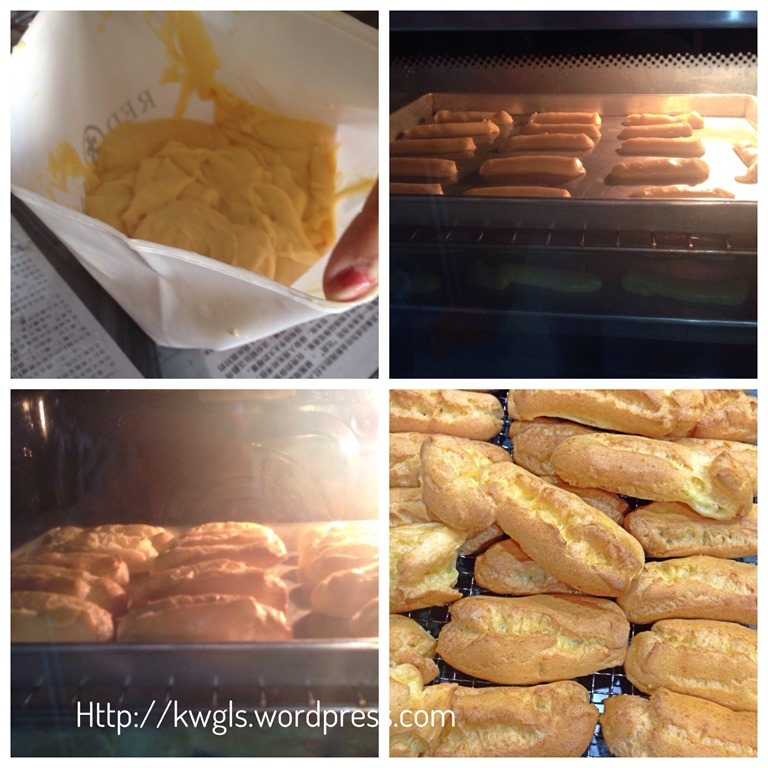 Pre-heat oven to the hot 200 degree Celsius. Line 2 baking trays with parchment paper or lightly grease the baking tray. In a sauce pan, place water and butter. Bring to boil. Take away the sauce pan and add in flour. Stir until well mix. Put it back to the stove and continue stirring until the dough leaves the side of the pan and forms a ball. 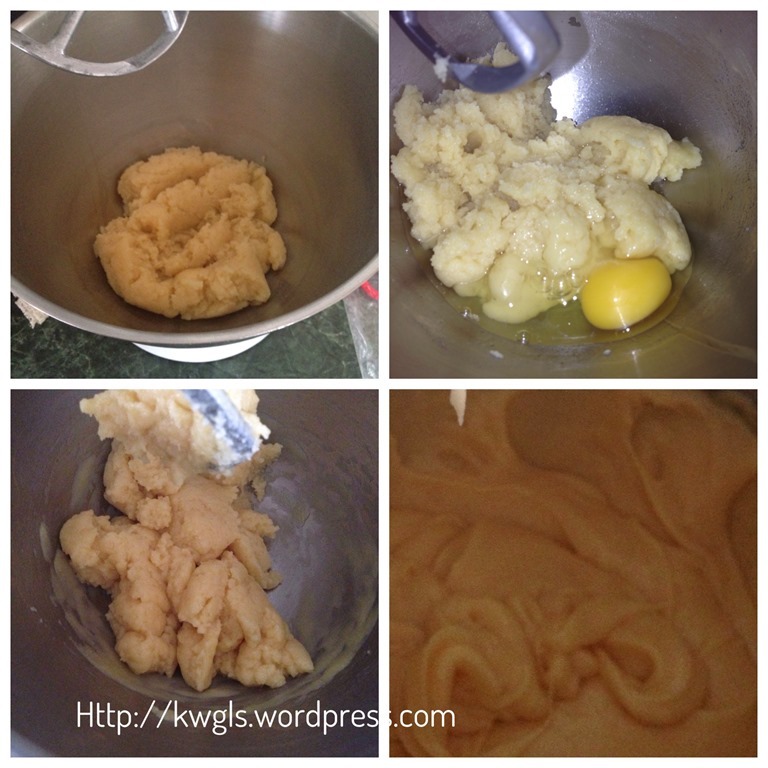 Transfer to the whisking bowl of a stand mixer. Beat the dough for about 30 seconds. 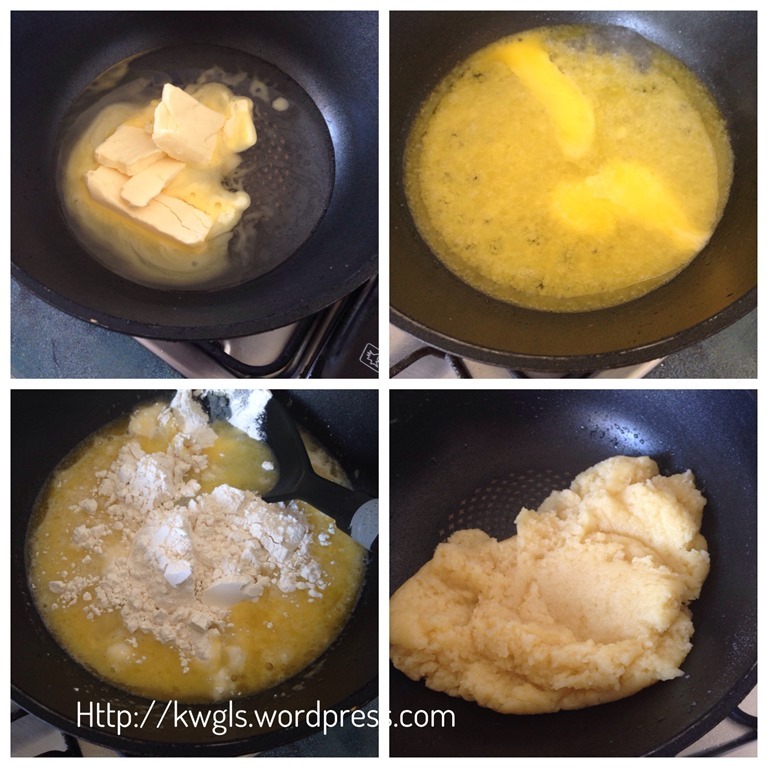 Add in one egg at a time and continue to whisk until the egg are well mixed. Repeat the same for the other 3 eggs. 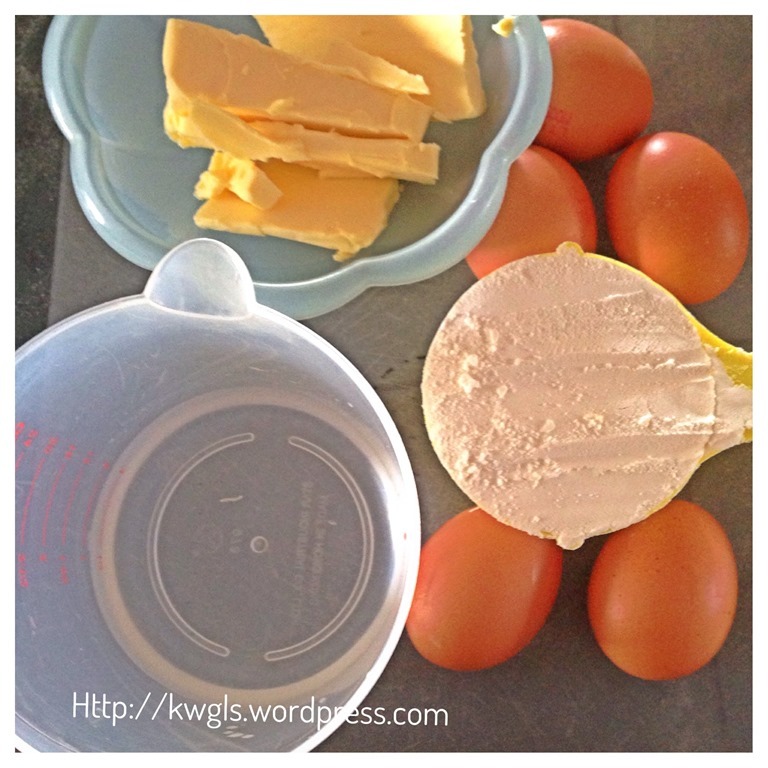 Do not add the eggs too quickly, otherwise, your dough will be very runny. If it is too runny, beat for several minutes or until thickened again. The end result of the dough should be glossy but not runny. Transfer the dough to a large piping bag fitted with 1.5 cm plain nozzle. Pipe to your desired length (about 8-10 cm) into the baking trays leaving room for expansions. Bake at 200 degree Celsius for 10-15 minutes and reduce the oven temperature to 175 degree Celsius for another 15 minutes or until golden and firm. Do not open the door during the first 20 minutes as it will deflates the puff when temperature changes and it is unlikely you will need to open the door. You don’t need to open the door when you reduce the temperature. 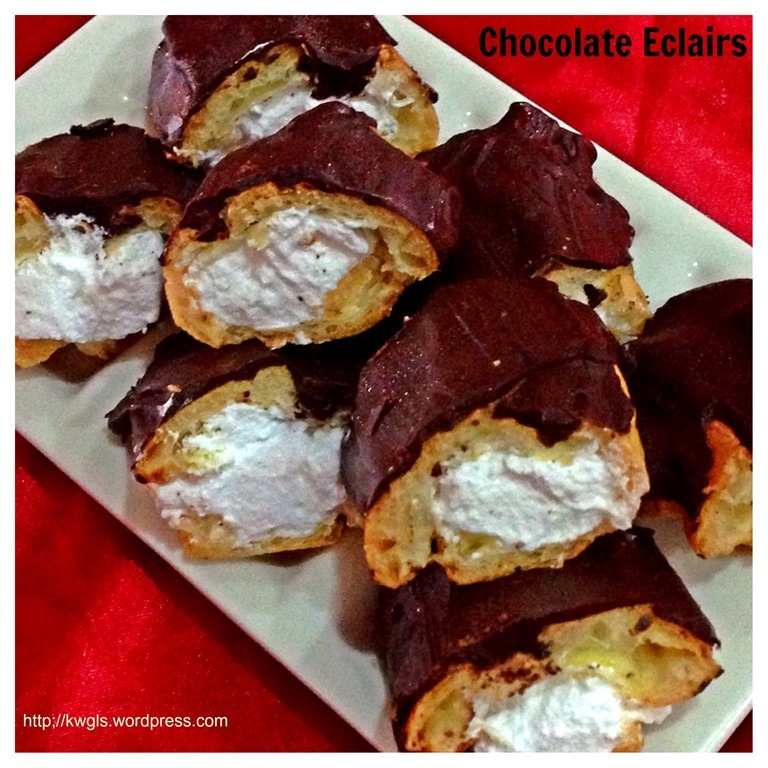 Once ready, take out from the oven and use a toothpick to poke a small hole on both sides of the éclairs to let the trapped moisture to escape. Cool completely on a wire rack . Meanwhile, whipped the cream until firm peak and set aside for later assembly. In a microwavable bowl, put the dark chocolate and microwave using high or medium heat for 1 minute until the chocolate melted. Set aside for later assembly. 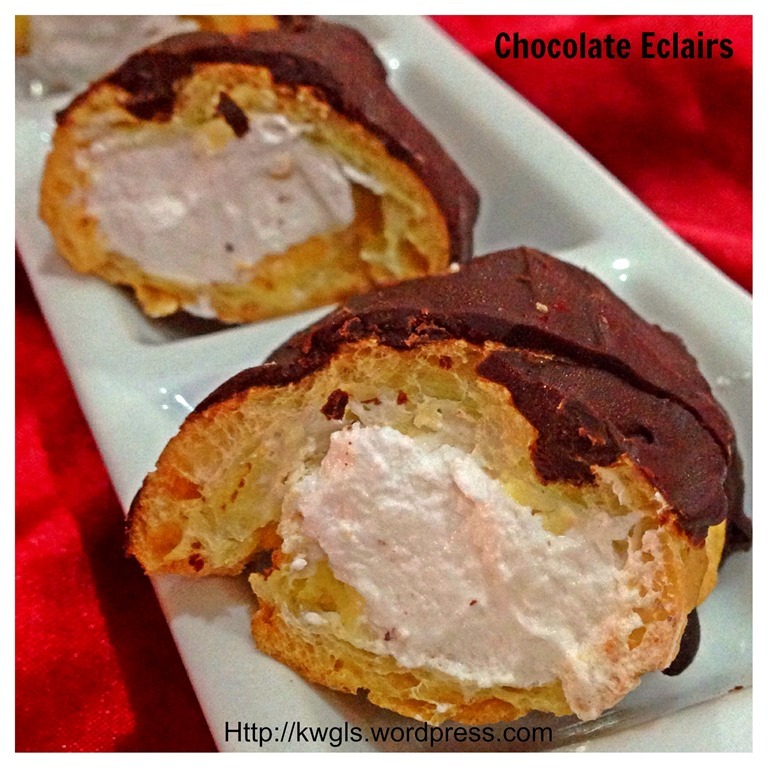 When cooled, split each éclair and pump in the whipped cream. 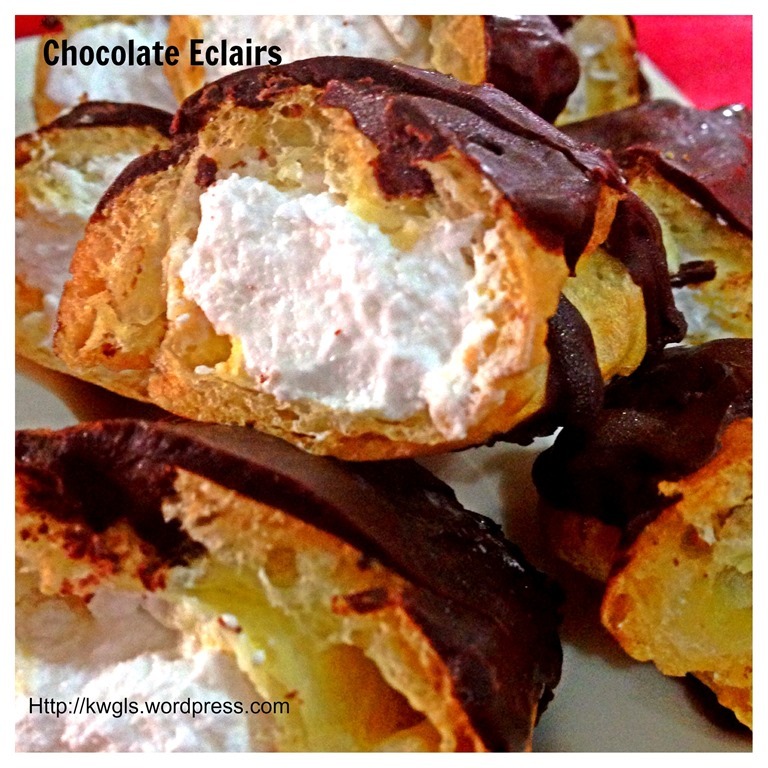 Spread/dip with melted chocolate. If preferred, chilled for about half an hour before serving. This is such a sinful indulgence. 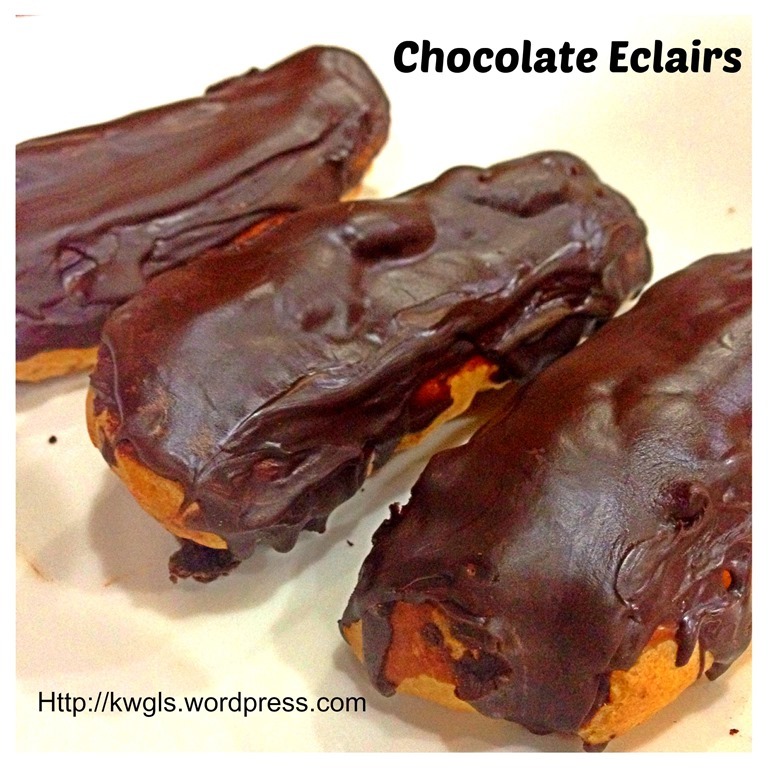 It is soft, light, creamy and full of chocolate fragrance. For purposes of serving my kids and family members, I have opted to cut it into one bite size.. it is addictive and one is definitely not enough for me..
For Four Seasons Blog Hop #25 (Nov 6) where I am the Co-host, please join us for the party where you can get a lot of the family related posts. Please click the above logo to enter your post. 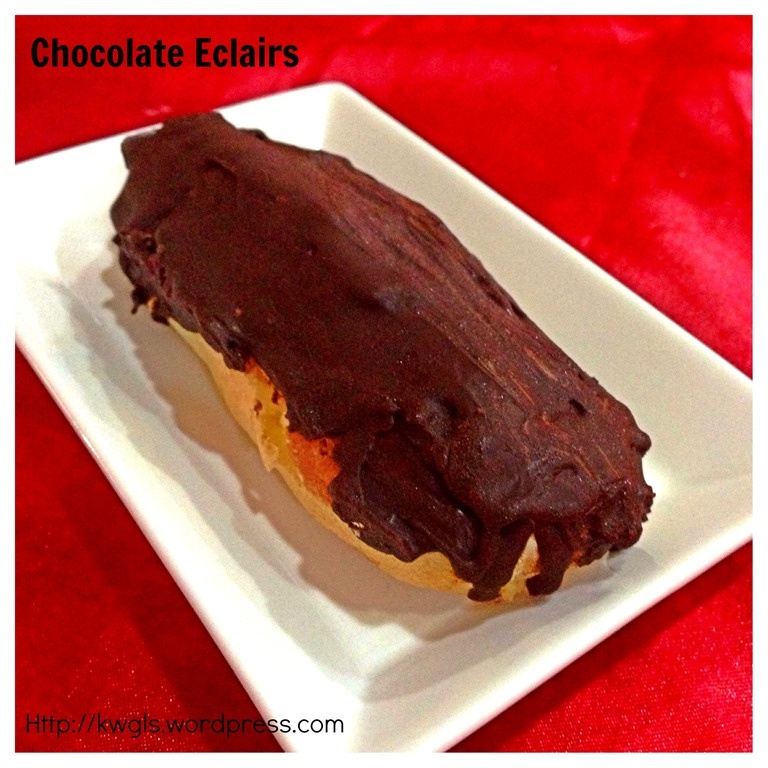 This entry was posted in Desserts, Food Preparation Series and tagged 8, Chocolate eclair, chocolate eclairs, choux pastry, cream puff, postaday. Bookmark the permalink. they don’t look ugly…they look delicious! YUM!!! The do not look ugly! I would happily eat them! 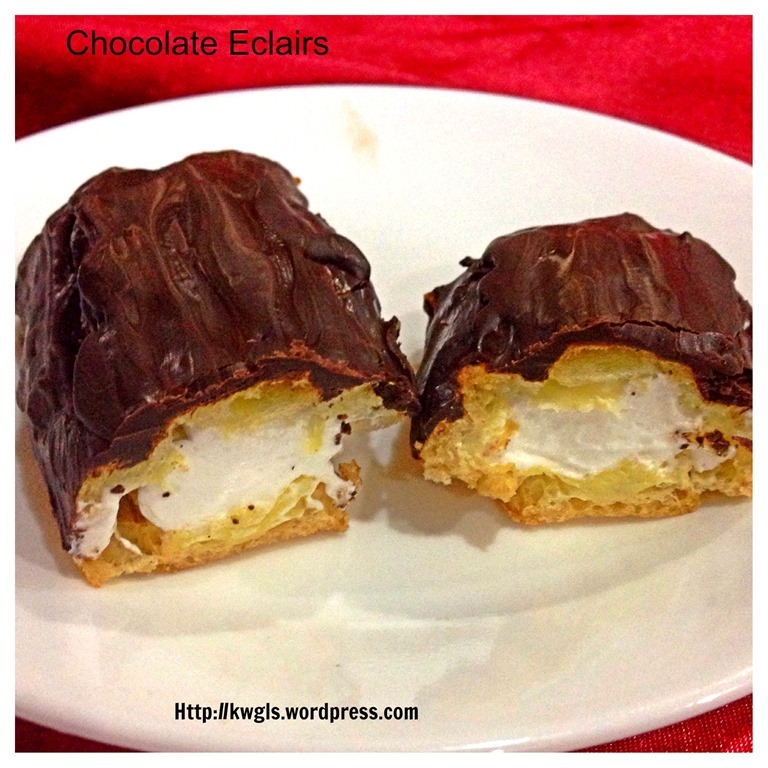 Thank you so much for stopping by and linking up at Saturday Dishes ‘CHOCOLATE” Blog Hop. I pinned it.